Celebrate Bike Month on Mother’s Day! 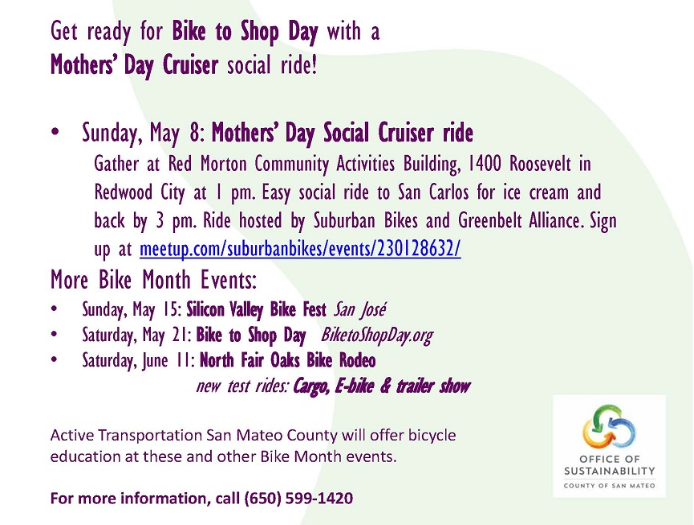 Treat Mom, kids, and yourself to a Mother’s Day Social Cruiser ride in Redwood City. Come dressed up in bows and boas, add a balloon or two, or just come as you are: it’s all for fun. Gather at Red Morton Community Center in Redwood City (1400 Roosevelt Avenue) at 1:00 pm on Sunday, May 8. After some introductions and information, we’ll ride north along quiet streets to San Carlos where we’ll stop for ice cream on Laurel Street, then return. The ride will be slow (10 mph), flat, and we’ll stop to chat along the way. Total distance round-trip is about 7 miles. The map shows the estimated route. Free! Sign up here or just show up! There will be a short review of bike riding tips before the ride. The San Mateo County Active Transportation program will offer bicycle safety education at this ride. For more information about bicycle traffic skills, contact ebarton@smcgov.org or call (650) 599-1420.